Regarding the engines: In October 2018 both engines were removed and completely replaced with new long blocks. The heads and injector pumps were rebuilt, along with the heat exchangers. The injectors were tested and confirmed to meet "as new" specs. The starters had been rebuilt recently. A spare starter is included. One alternator was rebuilt -- the other tested fine. The port alternator is rated 80 amps and charges the starting bank. The starboard alternator is 100 amp and charges the house bank. Prior to the re-builds the engines had been serviced regularly so many of the external hoses were already newer so only those that needed to be were replaced; All water pumps were replaced. The reason for the rebuilds was that both engines were examined internally with a scope through the injector ports and the cylinder walls were found to be scored; Also on one engine there was a compression leak between two of the cylinders in the area of the head gasket. It was determined by the owner that since one engine had to be rebuilt he might as well rebuild both. The generator is a Kohler 12 KW in a sound shield and equipped with an auto shut down for low oil and high temperature. House bank has 10 6-volt AGM batteries providing 1950 amp-hours at 12 V.
Engine start batteries 2 12-volt 8D AGMs. Bow and stern thrusters each have 2 12-volt AGM batteries (24V systems). Each system has a dedicated charger. Kubola furnace has 2 12-volt AGM batteries (24-volt system) with a dedicated charger. The total LOA with a tender on the davits is 65." DeFever designs have been built in many yards. Angel Marine is a Taiwanese yard regarded as a quality boat builder. Waterline Boats / Boatshed did not independently verify capacities and measures, which are reported from seller-provided information and/or literature. The vessel is boarded on either the port or starboard side via a folding stairway and opening doors in the side-deck bulwarks. The boat has easy access to all areas of the main deck. You may enter the main saloon aft through side doors or the pilot house forward. You may also access the Portuguese bridge and the fore deck. Entering the pilot house you are at the centerline helm station. There is plenty of extra seating behind the helm for your guests, with a table. On the port side of the pilot house there are companionway stairs leading to the forward cabins. The fore cabin has upper and lower bunk beds and an ensuite head with shower. There are lots of cabinets for storage and a closet for hanging clothes. Moving aft is the guest cabin with a comfortable queen bed and an ensuite head and shower. There are storage areas under the bed and in the closet. The engine room is accessed through a door at the aft end of the guest cabin. The engine room is full height with 6' 4" headroom. It is clean and well kept. There is a fold-down work bench on the port side. There is plenty of room to access the engines and machinery as well as plenty of storage port and starboard with natural light from hull side windows. You walk through the engine room aft and enter the master cabin. You pass through a small utility area that has storage shelves and the washer and dryer. The master stateroom utilizes the full width of the boat, providing for a queen size center line double bed and plenty of cabinets, counters and hanging locker storage. On the port side is the ensuite head with separate shower and small bath tub. Exiting the master stateroom you ascend the starboard companionway stairs to the main saloon. Going aft through the double sliding doors gives access to the aft deck where there is plenty of room for a freezer and outside seating. There is also a ladder to the upper deck as well as a ladder for access to the swim step. There are two custom made stainless steel davits with electric controls for lowering the tender mounted on the transom. Re-entering the saloon from the aft deck to port is the L-shaped dinette and saloon table. Further forward is the the rather large galley which utilizes the full width of the saloon. To port is a U-shaped area which includes a house size stainless steel refrigerator with freezer, ice maker, a modern propane four burner stove with oven and a microwave. There is lots of storage under the counters and above. The double stainless steel sink includes a garbage disposal. There is a pantry to starboard for additional storage which includes additional counter space and the dishwasher. The pilot house is easily accessed through the galley. There is a stairway on the starboard side of the pilot house leading to the fly bridge and upper deck. The flybridge is covered with a bimini top and there is plenty of seating for guests. The upper helm includes all same navigation instruments and controls of the lower helm. All deck and interior floors are beautiful teak. The cabin heating is a hydronic Kubola diesel-fired furnace with zone temperature control in all cabins. Also marine grade electric bulkhead mounted heaters are installed for use while shore-side. The Kubola heating system was serviced in January 2019 to assure full working capacity. The hot water system is heated by electricity, the engine hot water and or the Kubola system. On the aft deck there are two teak chairs. On the boat deck there is a couch and various loose chairs. Installed in the port side of the Portuguese bridge is a high pressure electric motor driven pressure washer. This boat does not include a tender but does include a davit capable of handling a large console-style dinghy. January 2019 - the compass was re-built and swung, and the autopilot compass was swung. Two VHF Icom radios and antennas (all new 2019), one for the pilot house and one for the upper hem. Raymarine autohelm with smart pilot control head; Raymarine model E120 multi-function display mounted at each helm station which includes radar, chart plotter, depth sounder, and GPS; Ship's computer desktop with HP Office Jetpro all-in-one printer, keyboard and mouse with a 17' LCD monitor; Bow and stern thruster controls at both helm stations. There is a Johnson pump that is activated upon high water bilge alarm as well an an emergence raw water pump from the engines. New in January 2019 a searchlight with remote. 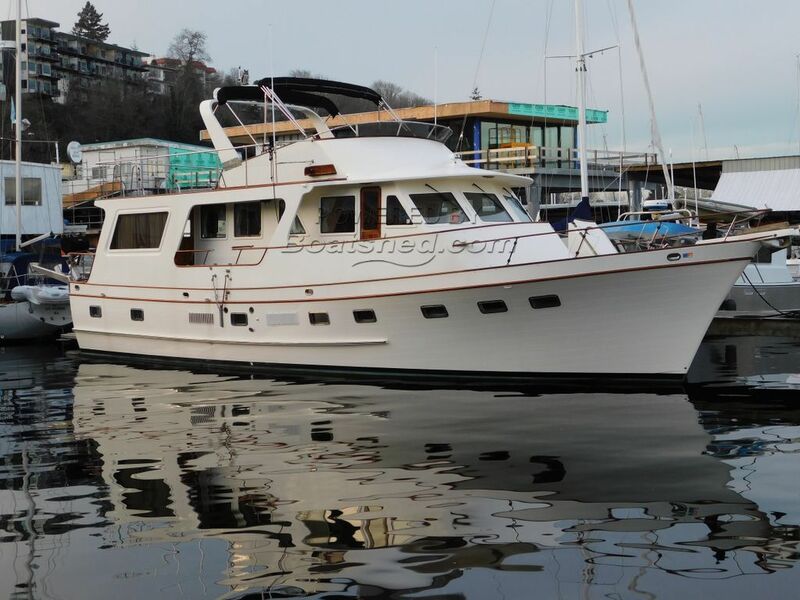 This 1984 DeFever 60 Flush Deck Trawler is a "must see" for anyone in the market for a large, live-aboard capable vessel. By looking at it you would not guess that she is a thirty three year old boat! The boat has had many upgrades and meticulous maintenance. The current owner is a very experienced yacht owner and sailor and he has been obsessive with making sure the boat is in excellent condition and ready to cruise anywhere. From the newer hull paint job to the gleaming varnished teak and shining stainless steel, one is enticed to come aboard. Since 2008 her major systems have been systematically renewed, improved and modernized. Bow and stern thrusters were added to aid in docking. The favored Caterpillar 3208 naturally aspirated diesels are "brand new" remanufactured engines with 1 hour showing since install in October 2018. The surveyor's summary from 2015 states "A fine example of an Arthur DeFever designed flush deck motor yacht. Materials and craftsmanship appear very good to excellent. The vessel has been maintained to a very high standard showing signs of ongoing maintenance and upgrades..."
The surveyor's summary from 2018 states that the boat has been well maintained. Every issue identified on this current survey has been addressed and corrected. This boat is the sole asset of an Oregon LLC, which may be purchased and which may provide tax advantages to the next owner. This DeFever 60 Flush Deck Trawler has been personally photographed and viewed by David Carleson CPYB of Boatshed Seattle. Click here for contact details.